The trouble with alimony is the differing tax treatment depending on whether you are paying it or receiving it. Throw in the tax treatment of Child Support and the complex calculation of changes in alimony over time and you can quickly have a tax mess on your hands. Here are some tips to help keep things straight. Alimony payments are deductible from gross income by the paying spouse. The spouse receiving the alimony must report this as ordinary income subject to income tax. Child Support is NOT deductible by the paying spouse. The spouse receiving the child support does not include this revenue as taxable income. 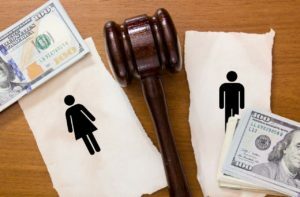 To keep the payer of alimony from deducting property settlements as alimony there is a special three-year recapture rule that applies to “excess” alimony payments. The formula is set by law and normally comes into play when alimony payment amounts vary greatly from year to year over the three post-separation years. The IRS often cross-checks to make sure that the amount one spouse claims as alimony on their tax return matches the alimony income claimed on the other spouse’s tax return. When there is a mis-match, BOTH tax returns could be flagged for an audit. Create and keep divorce and separation agreements. Keep all divorce and separation agreements indefinitely. This includes any written documentation that can support your treatment of the alimony. Save all canceled checks and receipts. Spell out in the memo line of each payment what the payment is. If you receive a check from a spouse and payment type is not noted, make a copy of the check and add your own memo as to the type of payment. You can use this information if you need to later reconcile the payments with your ex-spouse. Clearly document child support payments. If you are receiving child support payments, make sure you also keep track of this as well. This information could also be used to support your claiming children as dependents on your tax return. If payments are in arrears consider where to apply funds. If receiving a late payment it often makes sense to apply those payments to child support first, as it does not impact your taxable income. The payer also runs less of a legal risk by paying child support first as late child support payments could result in payroll liens. While you often cannot avoid problems with how an ex-spouse applies payments and dependents on their tax return, by being prepared you can more readily solve these problems should they come up.